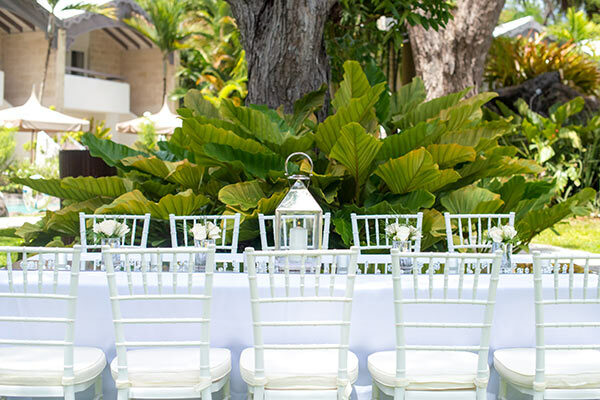 Elegant Hotels, one of the Caribbean’s leading luxury hotel brands, joined forces with celebrity wedding designer Emma Corrie to launch four new wedding design concepts alongside their refreshed luxury 2019 wedding packages. The creative behind the design of the Caribbean, Emma brings her background in theatre, art and culture to life at Elegant Hotels by marrying Caribbean charm with sophisticated style. • Timeless…for those wanting a sleek, elegant décor, the Timeless collection uses a white, silver and crystal colour scheme, incorporating hydrangeas, cream roses, silver lanterns and crystal chips. • Starfish…captures the essence of the Caribbean with nautical rope, starfish, white pearls and beach sand all in keeping with white, pastel and seashell hues. • Barefoot Elegance…for a rustic beach feel, this concept taps into a white and natural earth palette, including driftwood logs, white flowers, wooden lanterns and natural burlap fabric. • Island Style…green coconuts, tropical flowers and palm leaves create a colourful, vibrant atmosphere for this island inspired décor. Offering beachfront locations with views across the Caribbean Sea, experienced wedding coordinators across the seven hotels and resorts will transform and enhance the fantastic tropical settings. The refreshed 2019 wedding collection packages consists of the classic Simply Elegant package, which can be upgraded to the Tropical Luxury and Just The Two of Us packages.• Simply Elegant: Elegant Resorts’ classic wedding package includes all the essentials to tie the knot, including a marriage license, ministerial services, round trip transfers and a dedicated wedding coordinator to make sure everything falls into place. On top of this, couples can enjoy a cocktail on arrival, personalised wedding website and gift registry, mimosa breakfast in bed and two glasses of Champagne to toast to their future. Guests can choose to wed in an intimate beachside or garden ceremony.• Tropical Luxury: Couples have the option to amplify their nuptials with the Tropical Luxury package, which includes a tropical floral bouquet and corsage, bottle of Champagne, wedding cake, nightly turndown service and complimentary room upgrade with late check out. • Just the Two of Us: For the ultimate Elegant Resorts wedding, guests can choose the Just The Two of Us package, which incorporates all elements of the Tropical Luxury package, as well as a private beach dinner under the stars, steel pan music during the ceremony, signature couple massage, romantic turndown service, personalised wedding gift and Champagne breakfast. Please visit Elegant Hotels Wedding site for more information here.